To Tatra on the "Ships starting with T" page. See also this external page (click in the photos to enlarge). The Australian War Memorial has another picture of this ship, from Aug.-1943 - external links. The caption reads: "Aerial starboard view of the Norwegian cargo vessel Tatra. 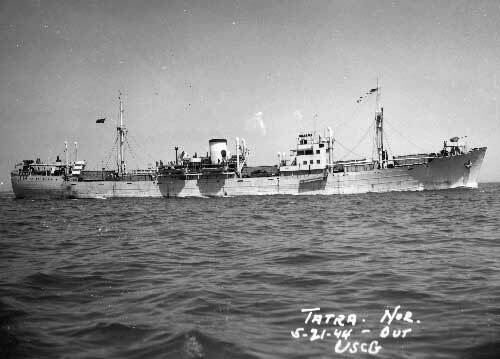 In November/December 1942 she was a member of convoy OW1 which included the Tarakan and Agovi Prince. They were carrying oil refinery equipment for Abadan, Persia." (Ref. link provided in the Voyage Record below). Launched on Oct. 31-1936 by F. Schichau G.m.b.H, Danzig (Yard No. 1378), completed Febr. 4-1937. 4766 gt, 2804 net, 7580 tdwt, 412.0' x 55.5' x 25.6', 8 cyl. 2 scsa oil engine of 5150 ihp by F. Schichau G.m.b.H., Elbing. Service speed 14 knots, 10 passengers. Aug. 4 Fremantle   US 20 For Abadan. Dispersed 0.10N 70 09E Aug. 16. Oct. 29 Alexandria New York City Nov. 24 GUS 20 Alexandria to USA. Dec. 25 Hampton Roads Port Said Jan. 21-1944 UGS 28 For Port Said. Apr. 5 Alexandria Hampton Roads* May 2 GUS 36 Alexandria to USA. May 23 Hampton Roads Port Said June 18 UGS 43 For Port Said. Aug. 23 Port Said New York City Sept. 18 GUS 50 Port Said to USA. March 13 New York City   UGS 80 Dispersed March 29. Nov. 26 Trinidad Rio Dec. 6 Independent (Stop at Trinidad not mentioned, Page 5). As will be seen when going to Page 1 of the archive documents, Tatra sailed from Galveston on Apr. 9-1940, the day the Germans invaded Norway. She had arrived the U.S. from Norway the month before. It looks like the intention was to return to Norway but, of course, this did not come to pass. She arrived New Orleans on Apr. 10, remaining there for over a month. Sold on Sept. 13-1962 to Marfianza Cia. Nav. S.A. (Michail A. Karageorgis S.A.), Greece and renamed Kalamata. Transferred to Panamanian registry in 1965. On Sept. 9-1968, she arrived Kaohsiung to be scrapped by Taiwan shipbreakers. Back to Tatra on the "Ships starting with T" page. There were 2 other ships by this name later on. The text on this page was compiled with the help of: Wilh. Wilhelmsen fleet list and misc. (ref. My sources).